Washington – The Senate plans to vote Wednesday on a resolution sponsored by Sen. Chris Murphy that would block a $1.15 billion arms sale to Saudi Arabia. It’s a long shot. But Murphy says he’ll win something even if he loses the vote. The Connecticut Democrat has launched a campaign to stop the Saudi sale, with the help of Sen. Rand Paul, R-Ky., because of the number of civilian casualties in Yemen, victims of the Saudi led- coalition forces and U.S.-made weapons. Saudi Arabia launched a military campaign against Yemeni rebels last year. Murphy said that even if the “motion of disapproval” failed, it would send Saudi Arabia a strong message and the debate over his resolution will help inform Americans of U.S. involvement in Yemen. Last month, the State Department gave preliminary approval for a massive,$1.15 billion sale to the Saudi’s of Abrams tanks, armored recovery vehicles (ARVs), machine guns, ammunition and grenade launchers. None of the weapons were made in Connecticut. A few days after the arms sale was announced, Doctors Without Borders reported that Saudi-led forces had struck one of its hospitals in northern Yemen, killing at least 11. U.N. Humanitarian Coordinator Jamie McGoldrick reported last month that at least 10,000 Yemenis have been killed in the war, about 3,800 of them civilians. The United States is conducting a low-intensity operation in Yemen. Besides supplying weaponry to the Saudi-led coalition, the United States is providing intelligence and military advisors. The United States also is conducting drone strikes in Yemen. “Most Americans do not know that the United States is involved in another war in the Middle East,” Murphy said. 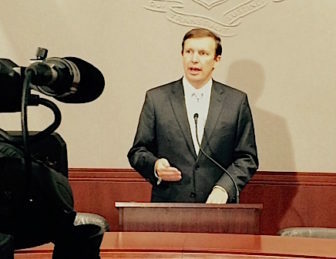 While the outcome of the vote on Murphy’s resolution is unclear, similar legislation was introduced in the U.S. House of Representatives on Tuesday. “Because the Saudi Arabia-led military coalition has continued to kill civilians in Yemen, we’re seeing more and more outrage from Congress,” said Rep. Ted Lieu, D.-Calif., who sponsored the House measure. Like Murphy’s resolution, Lieu’s provision has bipartisan support. But the campaign to halt the sale is considered a long-shot by many. Saudi Arabia was the No. 1 buyer of American-made weaponry from 2011 to 2015, according to the Stockholm International Peace Research Institute. Still, the Obama administration has reversed course before. In May it halted the sale of about 400 cluster bombs to the Saudis after human rights organizations documented the weapons’ use in civilian areas. Meanwhile, on Tuesday Sen. Richard Blumenthal also objected to U.S. policy toward Saudi Arabia by urging Congress to stay in session to override President Obama’s expected veto of legislation that would, for the first time, allow victims of the 9/11 attacks to sue the Saudi government. Congress hopes to adjourn next week and not reconvene until after November’s election. Approved by large majorities in the House and Senate, the legislation would allow victims of terrorism and their families to sue foreign actors that sponsor or support violent extremism. Saudi Arabia did not order the 9/11 attacks — but 15 of the 19 hijackers were Saudi, and 28 previously classified pages of a 2002 congressional report revealed multiple links between the terrorists and Prince Bandar, former Saudi ambassador to the United States.